Beijing - The United States said it was planning more one-on-one talks with North Korea in a push to make progress in multinational negotiations aimed at dismantling North Korea's nuclear program. Chief US envoy Christopher Hill held what he called "lengthy and substantive" negotiations with his North Korean counterpart Kim Kye-gwan on Tuesday and said he planned for more of the same as talks entered their third day on Wednesday. Hill also stressed the need for North Korea, also known as the Democratic People's Republic of Korea (DPRK), to take steps toward giving up its nuclear arsenal. "I think the DPRK needs to work on this because I do believe that at the end of this six-party process, however it turns out, it will help determine that country's future in a way that I think is fairly profound," Hill told reporters late on Tuesday. The talks, which group the two Koreas, the United States, Japan, Russia and host China, are the first in more than a year, and are taking place in the shadow of North Korea's first nuclear test on October 9. The other five parties say they are hoping to make progress implementing a September 2005 agreement in which North Korea agreed in principle to give up its nuclear weapons in return for aid and security guarantees. "Putting it into practice in stages is the reasonable and realistic choice," China's chief negotiator Wu Dawei said in a statement. But North Korea opened the talks saying it would not compromise until UN sanctions and US financial curbs against it were lifted and it was provided with a new nuclear reactor. 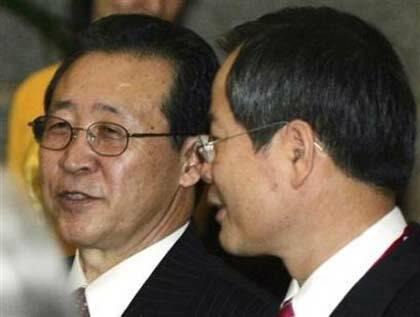 A separate delegation from the US Treasury Department was expected to hold a second day of talks on Wednesday with North Korean bank officials about the financial curbs, though envoys cautioned that any progress would be a long-term process.